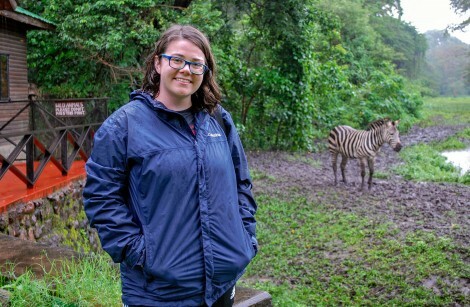 Michicich and 11 other OWU students traveled to Tanzania for two weeks in May as part of their Travel-Learning Course. With guidance from zoology professors John Gatz and Amy Downing, the students visited two parts of the Serengeti ecosystem – Ngorongoro Crater (the eighth natural wonder of the world) and Serengeti National Park. They also visited Arusha National Park, Lake Manyara, and Tarangire National Park as they observed firsthand the animals they had just studied in class. Why did you choose this OWU Connection experience? What key lessons did you learn through your travels? “Having taken the class, I was able to identify species and know about them and characterize their behavior. Knowing facts beforehand allowed you to spot more animals and to appreciate the diversity and experience even more. “For example, we learned about big cat hunting behaviors, or flehmen in ungulates, or lion reproduction. Then we actually saw all the big cats doing distinct behaviors. … To a regular tourist, they may not know what was happening or why, but because we spent 15 weeks studying the animals of East Africa, we were able to appreciate what was going on and to see natural phenomenon and ecology in action. Why do experiences like this one matter? “It exposes you to direct applications of your field of study. We went to national parks where researchers do zoological studies and scientists work extremely hard to conserve the wildlife. “For those interested in conservation, ecology, or zoological research, they got to see the types of research questions they could ask in action and, more broadly, we saw important biological phenomenon. It gives you a great appreciation for the natural world and the need to preserve and conserve biodiversity. “I also really enjoyed the cultural aspect. We got to visit a Maasai tribe, a public primary school, and a local village. It allowed us to learn about a different way of life and allowed me to appreciate the rich history of Tanzania. “Tanzania is unique in that they have tribes that are still living as they have for centuries who have very traditional customs, while at the same time have areas where people from all different tribes live together and act as a community of shared interest and have more modern ideals. “The government has an interesting job of balancing and respecting old traditional tribal values while maintaining social justice and preserving modern rights. Learning about the different ways of life was very interesting. Why did you choose Ohio Wesleyan? “It got on my radar because it had genetics as a small undergraduate institute. It's rare for such a small university to have genetics. “As I learned more, I fell in love. I loved the rigor of classes and the fact I could get involved in research. I loved the close-knit feel of the campus. I was also attracted by the travel opportunities.